The device was made safe by a bomb disposal team yesterday afternoon. ONE MAN HAS been arrested in connection with the discovery of a viable device at a hotel in Dublin. 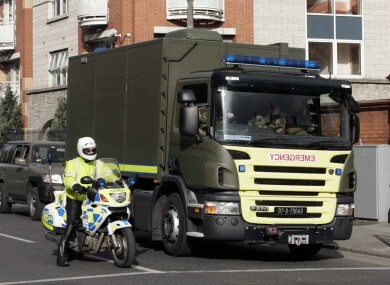 The device, which was made safe by an army bomb disposal team, was found in a car outside a hotel in Lucan yesterday afternoon. The man, who is in his 50s, is currently being detained at Lucan Garda Station under the Offences Against The State Act, 1939, meaning he can be held for up to 72 hours. The Defence Forces confirmed that the device, found at the Finnstown House hotel, was viable and capable of causing damage. The discovery of the device yesterday led to guests at the hotel being evacuated. Email “Man arrested after viable device found at Dublin hotel”. Feedback on “Man arrested after viable device found at Dublin hotel”.